“The Skyline Loop trail has been a spring classic for me for years. Some info on it can be found at https://www.vancouvertrails.com/trails/levette-lake-loop/. I would suggest following the loop clockwise and, unless you are keen, leaving out the 45 minute road walk up to Levette Lake and back. 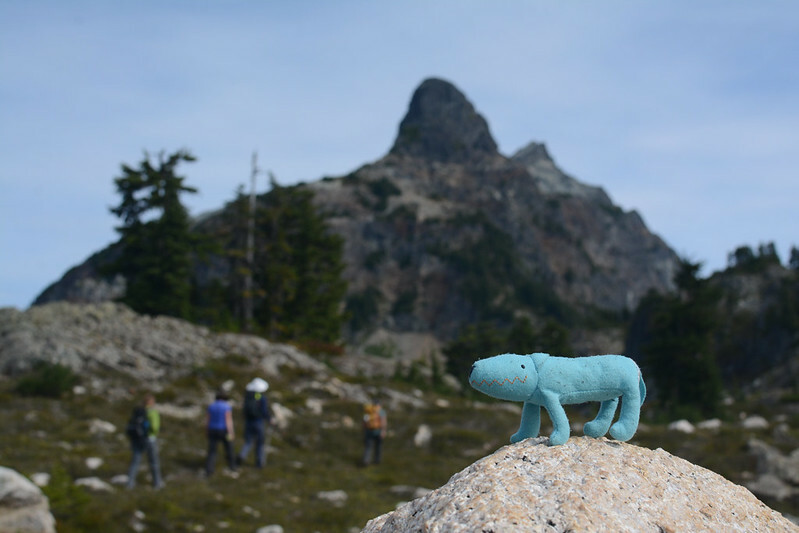 “Well I wanted a smaller group to return to Elfin Lakes 12 years after my first Wanderung hike, and I got it! Louise, Susan, and Gloria decided to brave the so-so weather forecast, which changed at the last minute to give us mostly sunny skies for the day. 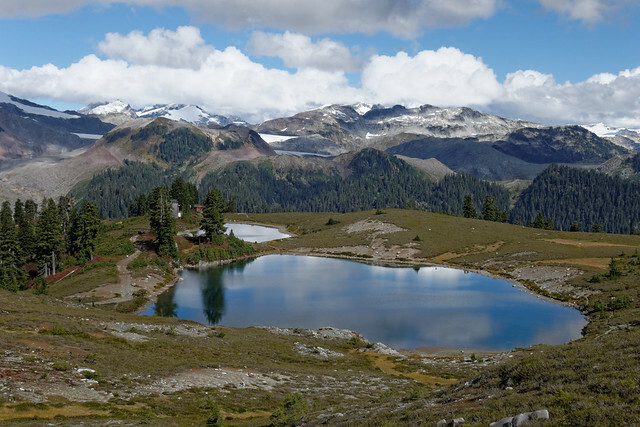 Garibaldi gleamed white in its dusting of snow from the day before, and the lakes were often still enough to yield perfect mountain reflections. We enjoyed a sunny lunch at a picnic table by the cook shelter rather than eating on the tent pads (which the other groups seemed to think was OK – a good opportunity to discuss some Leave No Trace principles). The shelter was empty and every bunk now has a ‘reserved’ label on it. The trail was quite busy – the parking lot was pretty full when we arrived – many of whom were backpackers on their way out. The hikers’ trail out of Red Heather meadows is being upgraded and is currently a bit of a sticky, slippery mud-fest. One of the backpackers on their way out slipped and ended up plastered from head to toe. We stayed on the main trail on our descent which meant keeping our eyes and ears open for mountain bikers (there were quite a few). The meadows have plenty of great fall colour but precious few berries. Our only wildlife sightings were a falcon and a bald eagle – not even a whisky jack or chipmunk though we heard pikas among the rocks. “With a forecast all week for sun for Friday, expectations were high. A little concern about 5 mins from the parking lot, when it rained slightly, but the clouds parted and we were treated with lots of sun today. Upper Shannon Falls is the 3rd highest waterfall in British Columbia and the hike to the top is well worth it. Today, our group of six parked in the Shannon Falls parking lot, but you can also park in the parking lot for the Sea to Sky Gondola, a short distance to the north. The initial part of the trail is shared with the trail for the Stawamus Chief hike. If you park in the Shannon Falls parking lot, you can see the bottom of the falls before your ascent. The trail is well maintained by BC Parks and there a few bridges to cross. Sections of the trail are steep, with some parts having nicely placed cobbles for steps. The trail was quite busy today and there were about 30 people at the top viewpoint. The trail rises steeply and there are a couple of viewpoints before the top. There is also a section of the falls, where you can get very close. There is also a nice pool of water in the creek, where you could go in – in the summer, but I would imagine the water is very cold all year. 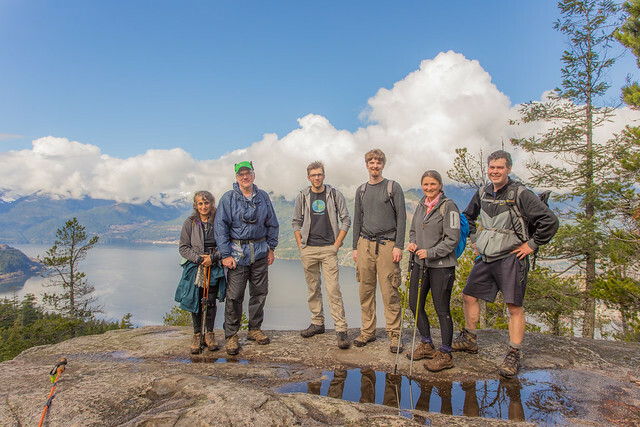 At the top, you are rewarded with an amazing view of the end of Howe Sound, the Stawamus Chief and Squamish. The bluff at the top is a large area and accommodates several people. Overall, the day turned out perfect and the group really enjoyed the hike.